2. Plug in the unit and bring to full steam. 3. Unplug the unit and allow to cool for 2 minutes. 4. Pour out all water. 5. 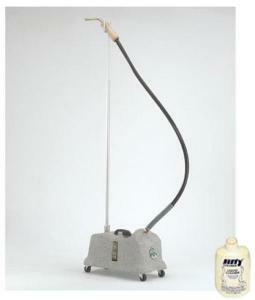 Pour in 5 ounces (1/2 bottle) of the Jiffy® Steamer Liquid Cleaner. 6. DO NOT STEAM THE UNIT WITH THE LIQUID CLEANER. 7. Leave the liquid cleaner in the unit for 3 hours. 8. Pour out the liquid cleaner solution. 9. Scrub with a stiff bristled brush to remove excess sediment as necessary. 10. Flush the unit 3 times with fresh water. 11. Resume steaming as normal.